Double Gun Bird Hunts: Est 1987, from a passion of true and traditional bird hunting, great dogs, fine guns, and hunters who appreciate the entire scene before them. "It is not a matter of taking game…..but how the game is taken." "This year marks the seventh in a row that the Basset-Mullin-Word contingent has descended upon Little Moran and the Grouse Lodge. In all those seven years, we have never experienced a hunt that was not deeply satisfying, or a meal that was not fit for royalty. The charm of Little Moran, for us, is the unchanging and unrivaled hospitality of the Grossmans, dedicated to excellence in all they do. At Little Moran, the welfare of the game, quality of the dogs, the safety and good times of the gunners, come first. It is simply a model of what a hunting place should be." It’s all about birds and bird dogs, the "Breath and Soul of a little bird church in the wildwood called Little Moran and Double Gun Bird Hunts." 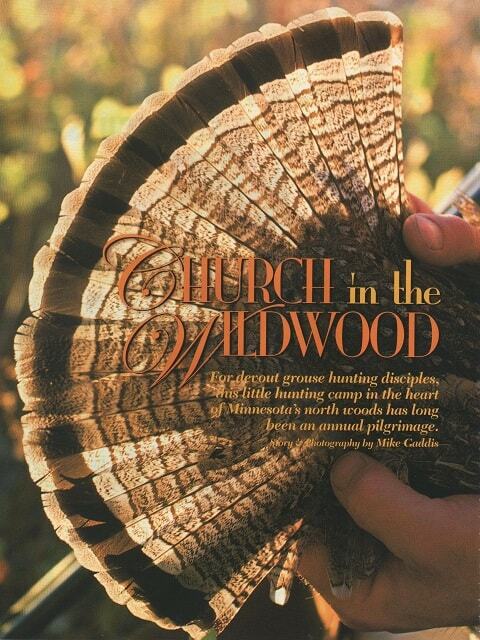 Well off the beaten path, Little Moran and Double Gun Bird Hunts is a "quaint and happy little cover, it is a grouse hunters camp, not an endorsed simile, but the smoke from the altar – in true Northwood's traditions." "Before I made my Pilgrimage, a grouse hunter once remarked to me, 'If you seek the wellsprings of your faith, you go to a chapel. If you wish the affirmation of your religion, you go to Little Moran and Double Gun.' High praise, but I could begin to believe. It has been built into the harbor of the heart, where an ardent fraternity of grouse hunting clients revere as a Mecca." "Steve’s passion for dogs and wild birds burn like a peat fire, hot and fierce beneath the loam surfacing in flaming pockets of exuberance at a great find, the escape of a wily old cockbird and the promise of a good brood year. "A true dog man, bird hunter and steward of the land." "It’s about the dog of then… the dogs of now… and the hunters who have gunned over them. As ever there would be, I hoped, and grouse and men worthy of appreciating them." "As long as there were these, there'd be a Little Moran, there’d be a scared place, and no matter where else we would live to be, always there would be a piece of us wanting our way back." "As Director of Wingshooting Operations, hunting is exclusively wild birds. I can't imagine a better, more qualified person for the job. A longtime professional trainer, guide, and shooting preserve manager, Steve is perhaps best known as proprietor of Little Moran and Double Gun Bird Hunts… his "Grouse Lodge.” Double Gun Bird Hunts and the Grouse Lodge have developed such a loyal following through the year that the only way a new guest gets a foot in the door is to come as a guest or to wait until older hunters retire or kick the bucket…." "The point is Steve does it right. He knows what it takes to run a first-class wingshooting operation-from the food, accommodations, and overall ambience, to the guides and dogs. He also understands the peculiar challenges posed by an operation that relies exclusively on wild birds."